Child car seats are one of the most important safety items any parent of an infant or toddler can own. Child car seats are designed to make sure that small children are protected during a car accident in a way that normal seat belts in a vehicle are incapable of doing due to the child's size. Unfortunately, a startling number of car seats are prone to failure, which can be especially dangerous during rollover accidents. Tragically, car seat failure is responsible for more than a hundred injuries or deaths each year. At the Willis Law Firm, we believe that if you were involved in a rollover accident and your child's car seat failed in some way, you should be able to seek justice against the manufacturer of the faulty child seat. For more information on your rights, contact our firm today at 800-883-9858. Many child seats have been tested by non-government agencies and have been shown to be severely lacking in true safety standards. 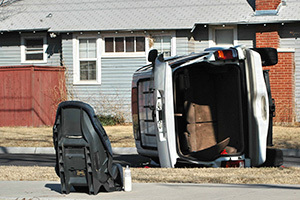 At higher speeds and during rollover crashes, many child seats are prone to disastrous failure. Parents should be able to rely on the child seats which claim to provide protection for their children. When a defective child seat results in harm to a child, the family has a right to seek compensation from the manufacturer. If your child was harmed due to a defective child seat, contact the Willis Law Firm today at 800-883-9858.